I bought a 1922 Emerson Northwind recently with some issues. Nothing too serious.I recently painted some parts on my car and had some clear and black left over, so that's what I used. 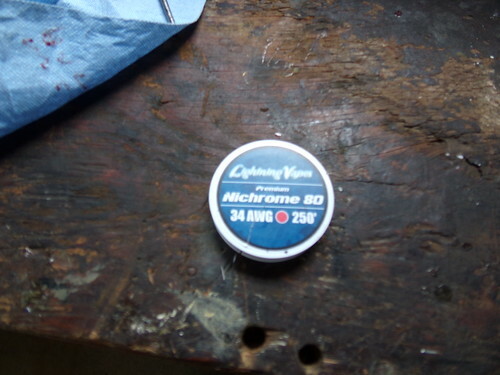 I also still have some Black Cherry pearl additive for the clear and I used that, too. I missed my GE fan painted like this so that's what prompted me to do this. Well, one of the issues was a burnt out speed coil winding. 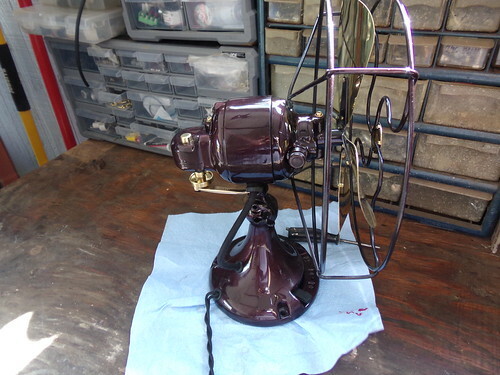 These fans used Ni-chrome or stainless steel resistance wire as basically a rheostat. I found exactly the right wire online and paid 5$ including shipping for 250 feet of the the stuff. Now I can rewind others, lots of them, as long as they require the same wire. Sorry about the fuzzy pic. The brand is Lightning Vapes. Apparently, this wire is used in vaping equipment, so if I was vaping I could rewind my own vape thingy? So, here's a short video of it with some explanation. By the way, inside a room in lower light, the fan looks as though it is painted a very dark brown color. It's only when the sunlight hits it that you can see all the cherry sparkles in the paint. My workbench has windows right above it, so in the video the sun is really bright making it look very sparkly, when while inside you don't really get that effect very much. Also, I cut and radiused brass wings for it because these little brushed motors can push a lot more air than they do with the flat wings. It runs 46, 55 and 62 watts on low, medium and high speeds respectively. Some of these are very quiet like this one and some have a lot of brush noise. I attribute that to low wear and probably the material the brushes are made of. I think they vary in hardness. Softer ones are likely quieter. Spectacular job Bill, a real looker! What method did you use to cup the blades? Nice! Thanks for sharing the video. I have a Grizzly slip roll that also forms rings for cages. One of the best tools I've ever had. And thanks for the nice comments. Right at the end of the video, the paper towel gets up into the blade. Now, I didn't stop the video there, the battery just went dead. There was no drama because of that, though. I like that color too. Heck of a $50.00 fan. I bought it from an AFCA member. You get the best deals right here. A lot of those fans are in those Antique shops are on consignment. You may want to look at the swap meets and flee markets. Go to the events that are off subject like car parts swap meets etc. William Dunlap wrote: I bought it from an AFCA member. Was this in a WTS ad, or did you buy it at a fan meet? In the very short time I’ve been a member here, my impression has been that the best deals in the Classifieds here have been mostly for parts. Most of the WTS ads for fans.... have only been links to eBay auctions, which I find interesting since that practice is banned on the other forums where I’m a member. I would do that but there aren't many swap meets in N. Indiana near me. Plus most of the flea markets near me including Shipshewana have never had any vintage or antique fans for sale whenever I've been to them unfortunately. I found it in the BST section. I've found some good deals there, but you have to beat some of the members here to them.......George, and others. William Dunlap wrote: I found it in the BST section. I've found some good deals there, but you have to beat some of the members here to them.......George, and others. Page processed in 0.1912 seconds (21% database + 79% PHP). 32 queries executed.